Longevity risk is different from many other risks an insurer faces because the risk lies in the long-term trend taken by mortality rates. 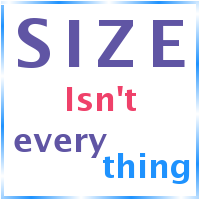 This trend unfolds over many years as an accumulation of small changes. 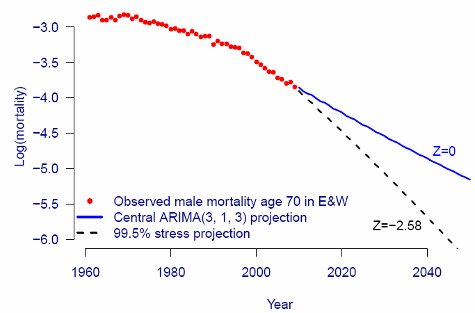 A natural approach to longevity risk is therefore to calculate reserves using a long-term stress projection from a stochastic model. The problem with the stressed-trend approach is that it is inherently multi-year, so does not fit within the Solvency II requirement to measure risk over a one-year time horizon. 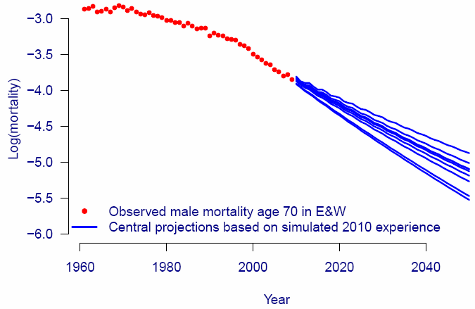 Most stochastic models can use the uncertainty measures to generate sample paths, which are simulations of future mortality, easily expressed as a grid of mortality rates by age and year. By using these mortality rates to simulate death counts which are then applied to known exposures to create future exposures, each sample path allows us to add a single additional year of simulated data to the population upon which the projection was based. We can now rerun our projection against the extended dataset resulting from each sample path. After following this procedure we have n sets of realised values of how life expectancies or annuity values can change based on the addition of a single year's data. These can then be used to set a capital requirement to cover potential changes in expectation of longevity trend risk at the 99.5% level. It seems obvious that wealthier people will have larger investments and pensions, so the use of benefit size as a proxy for social class is a well established practice. But how well does this actually work, and is there a better way?